On Thursday, Oct. 11, Pope Benedict instituted the Year of Faith for the whole Church. It will end on the Solemnity of Christ the King, Nov. 24, 2013. 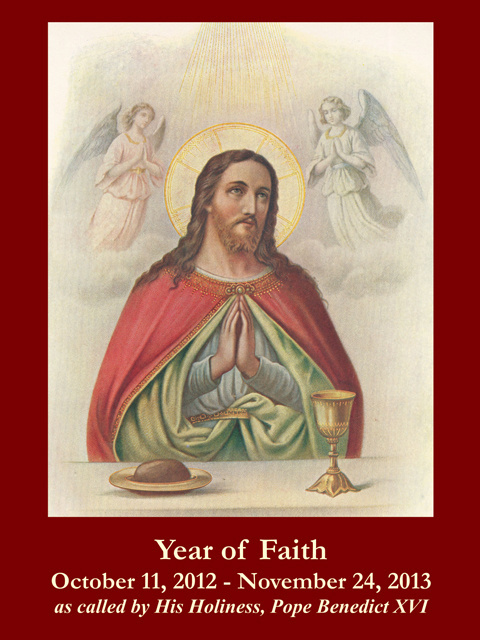 Why a "year of faith?" His holiness wanted to renew evangelization throughout the world. Christ is central to all human beings and to all creation. God sent his Son to redeem us through his death, to reconcile us to Himself. This is true for everyone, believers and unbelievers. Evangelization means making people aware of it. Jesus told his Apostles to bring the Gospel to the whole world (Mark 16:15), baptizing in the name of the Father and of the Son and of the Holy Spirit (Matthew 28:19). Why begin this renewed apostolic work on the 11th? This date marks the fiftieth anniversary of the opening of Vatican Council II in Rome. The purpose of the Council was, we can say, to do what the Pope is asking for now: to bring the light of Christ to everyone, that all might be one in Him. It was hoped that the eternal truths of our faith would be taught in more effective ways commensurate with the modern world. By no means was doctrine to be changed. Nor were the Sacraments or devotions to be eliminated or substantially altered. Unfortunately, this happened in too many places and for too long a time because of bad catechetics and heretical opinions. Right now, the Pope is asking that all Catholics really know the faith and live it. By doing so, your life becomes a catechism which evangelizes. So, many people, even a lot of Catholics, have erroneous ideas about what the Church is and what she teaches. Reading The Catechism of the Catholic Church, watching EWTN on tv or going online to www.ewtn.com and www.vatican.va/phome_en.htm will keep us on solid ground and show us what is in fact true. St. Francis said to preach by example and, if you must, use words. Let us try to be catechisms of the faith, authentic and true.